Question : How can you effortlessly raise money for Mothers’ Union funds? Answer: Easily by signing up to Gift Aid. • You must personally pay income tax (or capital gains tax) at least equal to the amount we will reclaim. If you are a higher rate taxpayer you can claim relief through your self assessment form. • However, if in future your circumstances change and you no longer pay income or capital gains tax you should notify us as soon as possible. • If you change your name or address at any time again please notify us as soon as possible. • You can cancel the declaration at any time by notifying us, and it will not apply to any donations (including your subscriptions) you make on or after that date or such later date that you may specify. • Finally you do not need to go through your Branch Leader or Treasurer but can sign up individually by completing the form and returning it to Gift Aid secretary. Let’s see how many people will take up the challenge. 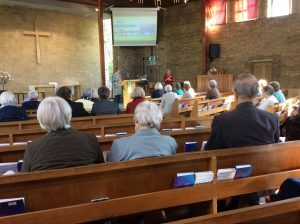 The meeting was held at St. Mark’s Church, Gabalfa, Cardiff on Tuesday 11 the October 2016. Please find Reports and Minutes below.